"Come at once if convenient�if inconvenient come all the same!" 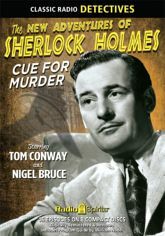 Through tales of ancient curses and international spies�through mysteries featuring men of title and creatures of the night�Tom Conway gives voice to Sir Arthur Conan Doyle's clever creation: Sherlock Holmes. The cerebral sleuth is accompanied and assisted by the able Dr. Watson, brought to life by Nigel Bruce. Also heard in these 16 digitally remastered and restored episodes are Ben Wright, Peggy Webber, Lurene Tuttle, Edgar Barrier, and Maxine Marx -- along with Mary Gordon as Mrs. Hudson and Frederick Worlock as Lestrade. Includes a Program Guide by Baker Street Irregular William Nadel.